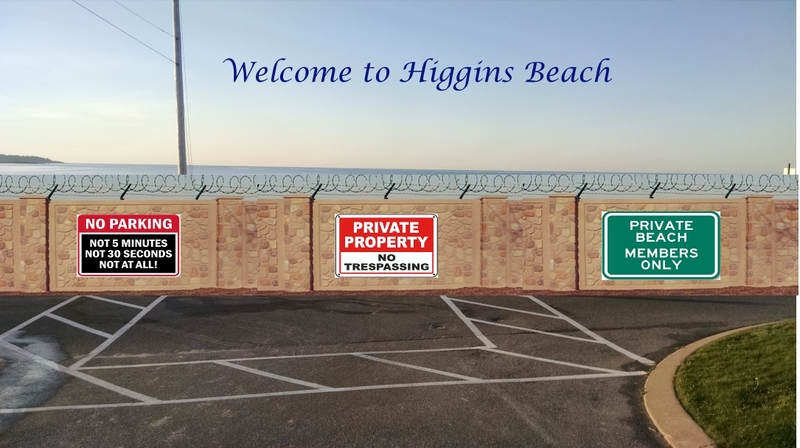 Higgins Beach goes private! | Look Out Scarborough! The proposed new view of Higgins Beach from the end of Ocean Avenue. Well, friends, yet another Town Council meeting creates a furor. Why does this keep happening in Scarborough? As reported in the last blog entry, two proposed ordinance changes for Higgins Beach were on the agenda. One to eliminate parking in the Bayview Avenue parking spaces between 6am and 7am. 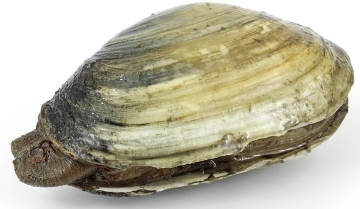 The other to prohibit “changing of clothes” at the beach. Both were unnecessary and utterly nonsensical for the reasons noted in the last blog. The Council tabled the “changing” ordinance and decided not to eliminate the first hour of parking (6am to 7am) at Bayview Avenue. BUT, in order to address the real but unstated objective, they voted 5-2 to change the current one-hour parking limit at Bayview to 30 minutes – effectively making it nearly useless for those who currently use the spaces, whether for a beach walk, a dog walk or surfing. And that, indeed, was the real objective – to get those darned surfers out of sight. The details of the unfolding drama follow. Those who are familiar with the history of Scarborough’s governing process will note how the same dysfunctional pathologies seem to repeat year after year. As noted above, the Town Council rejected the two ordinances that were before them, perhaps because the public outcry against them was so overwhelming and persuasive. But the privatization forces didn’t skip a beat in moving toward their real goal of limiting access to Higgins Beach. The amendment to change the one-hour parking limit on the Bayview Avenue spaces to 30 minutes was approved by a 5-2 vote (with Councilors St. Clair and Hayes being opposed). Of course it’s not possible to do a whole lot of recreating in 30 minutes, but that was the purpose of the amendment – make it next to impossible for the folks who currently use the spaces to do what they enjoy at Higgins, whether walking, surfing, fishing or whatever. Now we don’t want to be beach chauvinists here, but Higgins and Co-op are not really comparable beaches. While both have sand, that’s about where the similarities end. Why the Town suddenly needs to have consistent parking limits at wildly dissimilar beaches escapes us. Frankly, we were surprised when usually practical and fair-minded Council Chair Holbrook introduced this amendment. More importantly, remember the origin of the complaints that gave birth to this amendment – early morning noise on Bayview Avenue. 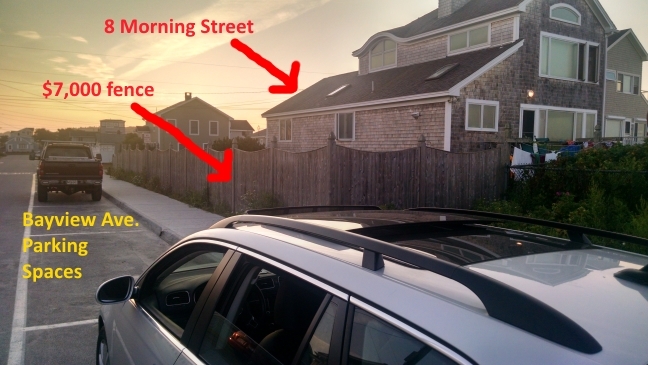 How making parking times consistent between two very dissimilar beaches is a solution to a supposed early morning noise issue requires a leap of logic we just cannot make. Indeed, if logic were among the tools at the Council’s disposal, they would have quickly rejected changing a one-hour limit to a 30-minute one. That change would potentially allow for the doubling of the number of cars coming and going from the spaces, thus creating more not less of the supposed noise. But logic obviously doesn’t matter here. Any thinly veiled excuse will do. As long as it discourages access to the beach, it will work for the privatization crowd. Perhaps even more startling than the private ownership statement was the willingness of Councilor Donovan to raise the possibility of the private owners potentially limiting public access to Higgins Beach. (Donovan insisted that the Higgins Beach neighborhood was feeling “abused.”) “No one wants to bar the gate,” he said at one point, certainly raising the possibility that the gate could be barred. “Barring the gate” doesn’t sound like a good thing for public access, does it? Western Beach being “renourished” this past winter. He also made the dubious comparison of Higgins Beach (which has a combination of public ownership and multiple private owners) to Western Beach (which has one private owner, Prouts Neck Association). He used the example of that Association decreeing their own rules for restricting dogs on Western Beach to highlight what a private owner can do. So we suppose if private owners can exclude dogs, they can exclude surfers—and others – as well. 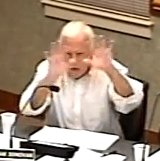 To see Mr. Donovan’s remarks, go to the video of the September 2 Council meeting at this link and advance the blue bar at the bottom of the frame to 1:41:20. It’s only 4-5 minutes and it’s very enlightening. Watch for the Councilor’s attitude toward surfers who are allegedly hogging the Bayview spaces. And ask yourself why the alleged hogging couldn’t be addressed with more enforcement rather than another ordinance. We’re the first to admit that Council meetings can be less than exciting at times, but every now and then you get a real treat like this one. And you don’t have to watch the whole 2 hours – just the good stuff! Speaking of Councilor Donovan, some have suggested that his ownership of a property at 8 Morning Street in Higgins Beach might create a conflict of interest with respect to voting on matters involving parking along Bayview Avenue. Indeed, 8 Morning Street happens to be directly adjacent to several of the parking spaces in question. Does one need to be a lawyer to determine that voting on a matter that involves parking spaces directly adjacent to a property you own might create at least the appearance of a conflict of interest? We understand that the Surfrider Foundation has formally requested that Councilor Donovan recuse himself from the Higgins debate. We doubt he will, but every now and then we are surprised that things work the way they should. Those of you with long municipal memories will undoubtedly find many elements of this story very familiar. 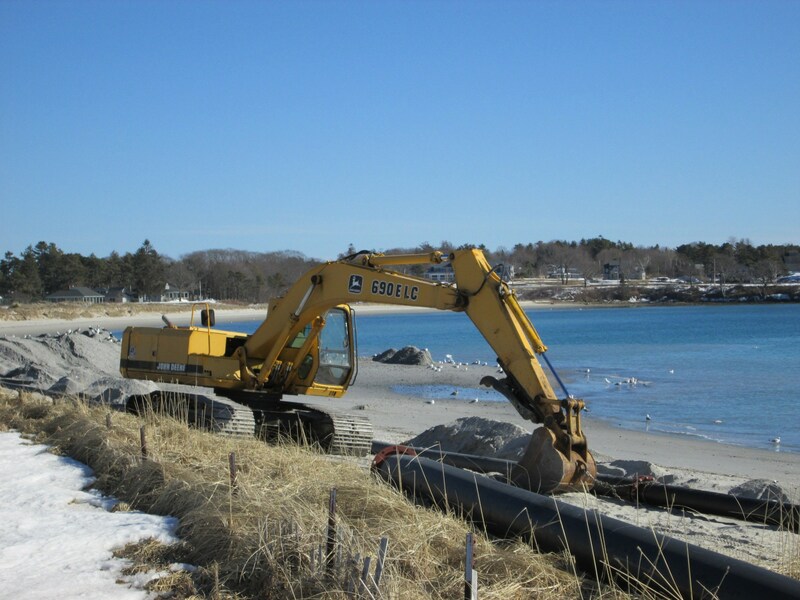 Indeed, the efforts to privatize Higgins Beach have been going on for decades now. The most recent effort occurred in 2010/2011. Check out this story from the Current on September 21, 2011. Deja vu all over again, isn’t it? Same players, same themes. Stay tuned for the next exciting saga in the Higgins Beach privatization story. 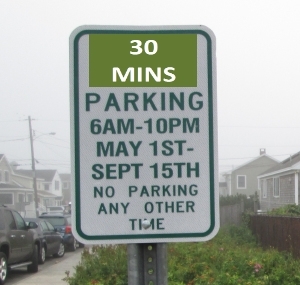 The Council is expected to act on the 30-minute parking limit change at its September 16 meeting. But that could change. Don’t be surprised if another amendment or two surfaces at the meeting – after public comment has been heard, of course. And who knows what may happen between now and the meeting.
. 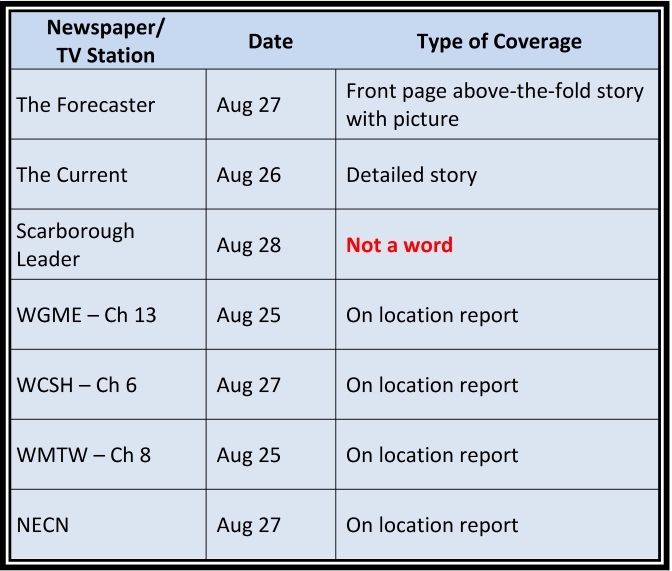 If you saw or read any local news these last couple of weeks, you know that the Higgins Beach controversy was front and center. Unless, that is, you depend on the Scarborough Leader for your dose of local news. With great sadness we note the passing of Judy Shirk, a life-long Pine Point resident. Judy was passionate about her community and very active in making it a better place. She was one of the founders of Pine Point’s 4th of July Parade. She may not have realized her example provided a role model and inspiration for others to work for a better community. Her presence at Pine Point will be greatly missed. There is an effort underway to memorialize Judy’s legacy at Pine Point. Please contact Bob Rovner at pgrmar1@aol.com for more information. This entry was posted in Uncategorized on September 7, 2015 by Site Author. Steve, nice looking wall. Since the cost of it was not included in the recently passed municipal budget, then the budget should be reopened. Councilor Donovan may have to request, once again, to open the municipal budget so the Town can share the cost of privatizing the beach. First responders, do you really need winter jackets and boots? Great post, as always! Very much looking forward to your coverage of the roll out of laptops at the high school.